Yet another columnist has seen the light and converted to manual portable typewriters. He's also found the Typosphere, and all the wonderful information that's available about typewriters there. 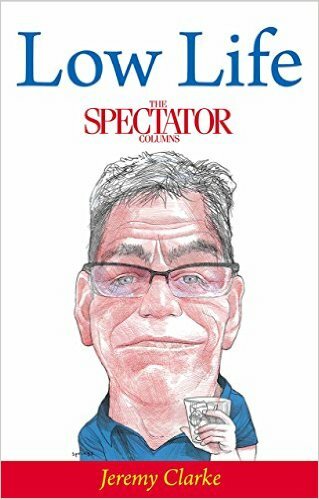 Jeremy Clarke (1958-), who writes the "Low Life" column (to offset Taki's "High Life") has, in his latest contribution to British right-wing magazine The Spectator, sung the praises of his Olympia SM9 and Olivetti Lettera 32. He opens the piece with reference to Mark Hughes' 11-minute YouTube video (above) devoted to the joys of typing on a Lettera 32 (not designed in the early 60s by Marcello Nizzoli, by the way, but developed from the 1949 Lettera 22 designed by Nizzoli.) The video opens, if I'm not mistaken, with Purcell's Music for the Funeral of Queen Mary, from Walter/Wendy Carlos' soundtrack of A Clockwork Orange. "Low life" indeed! 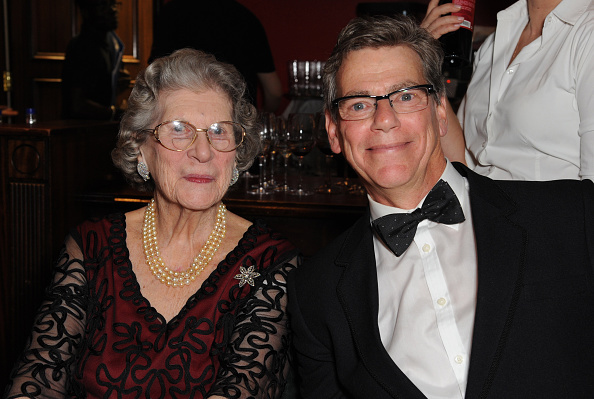 Jeremy Clarke cavorts with the trumped up Baroness Trumpington, a Conservative member of the House of Lords (and ladies?) at The Spectator Cigar Awards dinner in last year. My favourite YouTube video clip this week shows a chap sitting at a desk typing. All you can see of him are his hairy forearms, poised hands and fast fingers. He types for ten minutes. Nothing else happens. The typewriter is a portable designed in the early 1960s by Marcello Nizzoli for Olivetti — the famous Lettera 32. Cormac McCarthy bashed out five million words on one of these, blowing the dust out of it now and again with the air hose at his local garage. He auctioned it a few years ago for a quarter of a million dollars. The video clip is a paean to the beauty and style of the Olivetti Lettera 32 typewriter. The camera lingers adoringly over every aspect of the teal, steel-encased typewriter, eventually focusing on the keys rising and falling and the typed letters accumulating on the paper. Our interest quickens as the letters form words, the words sentences. Surely, he’s not going to divert our attention from this epitome of Italian design by saying something witty or personal, is he? The quick brown fox jumped over the lazy dog will do nicely, thank you, matey. A rather unnecessary confession, this, we feel, given the circumstances. But we know the compulsion only too well. It’ll only get worse, old son. Good to get it off your chest, though. Well, that might have been me sitting there typing that. I couldn’t have put it better myself. For I, too, have lately fallen in love with old manual typewriters, and for the same reasons. I love the dotty clatter of the key-strikes, the warning tinkle of the little bell, the thump of the carriage return. I also like the odd transaction of words on paper in exchange for an extravagant expenditure of physical energy. And yes, the absence of a Safari icon, for those of us who simply cannot help ourselves, is indeed a big plus. But as the guy says, the most invigorating thing about typing on a typewriter is the requirement to think ahead, and in complete sentences. On a word processor the temptation is to inch one’s way into a sentence word by word, then fiddle with the word order until black in the face. The only way to write on a typewriter is with your trousers on fire, smashing down one extempore sentence after another, not giving a damn about anything. Very refreshing it is. Of course the results aren’t pretty. But then neither are first thoughts. To those over a certain age to whom I’m talking old hat, I apologise. The only writing machine I have known previously is the word processor. The rackety thrill of writing on a manual typewriter is entirely new to me. My first, a seized-up old Olympia, I bought six weeks ago at a car-boot sale for 11 quid. I carried it home, pressure washed and oiled it, put in a new ribbon, and began typing. The solid, even, spacious typeface looks like the one God used for the Ten Commandments. It works perfectly. Pleased, I did a bit of research. I discovered that I was the proud owner of a wide-carriage Olympia SM9, manufactured in West Germany in 1964. The early SM9 is considered by many to be the acme of typewriter design, technology and quality of materials. It is the typewriter of choice, apparently, for some very famous writers I haven’t heard of. After the Olympia SM9, so-called ‘typosphere’ opinion states that the next best typewriter ever made is the aforementioned Olivetti Lettera 32. Olivetti factories in Italy and Spain turned out millions of them. I bought one for £5.99 plus ten quid postage on eBay and I love it obsessively also. It’s like being in love with two women at once — one a slim, stylish Italian; the other a heavyweight, straight-talking German — and loving them with equal passion. All of which perfectly illustrates, I’m afraid, ladies and gents, what a complete bore I have lately become. 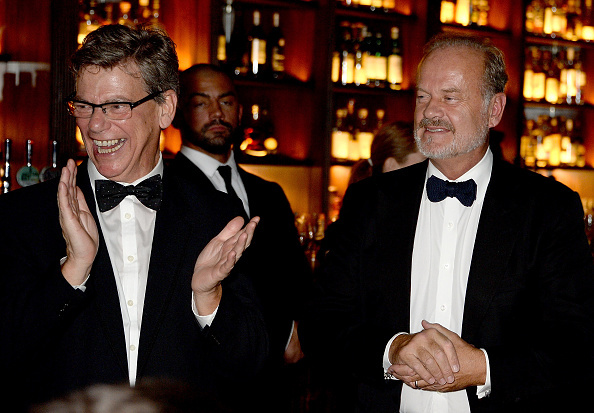 Jeremy Clarke with Kelsey Grammer at The Spectator Cigar Awards dinner last year. I'd like to think that's the Mark Hughes who was also a "great striker" for Manchester United. Love the Kubrick-stylee musical score. Well, Steve, if the soccer player has "hairy forearms" (as many of them do) it could well be him! Who knows? I couldn't out anything about the guy who put the video up. But it certainly caught "Low Life's" attention. Funny you should mention that Ted, I didn't notice it until I read one of the comments on YouTube. Very encouraging to see that the typewriter renaissance is not yet over.